Amica Insurance has once again received the “Highest Customer Satisfaction Among National Homeowners Insurers” ranking in the J.D. Power 2016 U.S. Home Insurance StudySM. 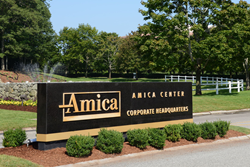 This marks the 15th year in a row that Amica has finished in the top spot. Amica’s score of 864 (on a 1,000-point scale) is 60 points higher than the national average and 30 points higher than its score in 2015. The study measures overall customer satisfaction based on five factors: interaction, policy offerings, price, billing process and claims. To learn more about the study, click here.